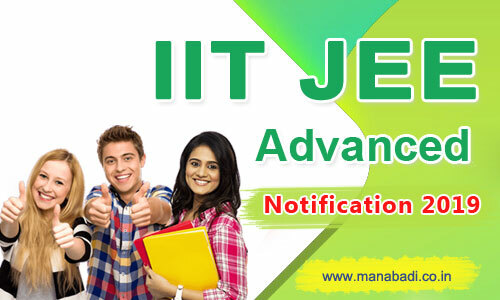 Indian Institute of Technology (IIT), Roorkee has released the Schedule of Joint Entrance Examination Advanced (JEE Advanced) 2019 on its official website. Due to the General Elections 2019, the examination date of JEE (Advanced) 2019 has been shifted to May 27, 2019 (Monday). IIT Roorkee is conducting JEE Advanced 2019 under the guidance of the Joint Admission Board (JAB) 2019. The candidates who qualify JEE Advanced will form the basis for admission to the Bachelorâ€™s, Integrated Masterâ€™s and Dual Degree programs (entry at the 10+2 level) in all the IITs. The Joint Entrance Examination (Advanced) 2019 JEE (Advanced) 2019 will be conducted by the seven Zonal Coordinating (ZC) IITs under the guidance of the Joint Admission Board (JAB) 2019. The performance of a candidate in this examination will form the basis for admission to the Bachelor's, Integrated Master's and Dual Degree programs (entry at the 10+2 level) in all the IITs. The decisions of the Joint Admission Board will be final in all matters related to JEE (Advanced) 2019 and admission to IITs. It may be noted that the schedule will remain the same even if 20 May 2019 is declared a public holiday. ONLY those PwD candidates permitted to use the services of a will get one hour compensatory time, i.e., the end time will be 01:00 PM for Paper 1 and 06:00 PM for Paper 2. All Indian nationals (including OCI/PIO) should satisfy each and every one of the five eligibility criteria. Registration will be cancelled if, at a later date, it is found that the candidate does not meet any of these five eligibility criteria. All the candidates must fulfill each and every one of the following five criteria to appear in JEE (Advanced) 2019. Candidates should be among the top 2,24,000* (including all categories) in Paper-1 of JEE (Main) 2019. A candidate should have appeared for the Class XII (or equivalent) examination for the first time in either 2017 or 2019. Candidates MUST register for appearing in JEE (Advanced) 2019. Registration is only through the online registration portal where detailed instructions for registration will be provided. After login, provide the basic data and the choices of the cities for the examination [See 19. CITIES AND TOWNS WHERE JEE (ADVANCED) 2019 WILL BE HELD]. The candidate will have the option of adding an additional mobile phone number and an additional email id, in addition to the number(s) provided during JEE (Main) 2019 registration. Please note that all the correspondence regarding JEE (Advanced) 2019 will be sent to the registered mobile number by SMS and/or to the registered email id by email. Pay registration fee [See 13. REGISTRATION FEE FOR JEE (ADVANCED) 2019]. Registration fee is NEITHER refundable NOR transferable. Given below is a list of certificates whose scanned copies are to be uploaded at the time of online registration for JEE (Advanced) 2019. The formats of the certificates are given below. Class XII (or equivalent examination) certificate (for those who appeared for this examination in 2017 or whose board declared the Class XII (or equivalent examination) result after June 2016). OBC-NCL certificate (FORM-OBC-NCL) should have been issued on or after April 01, 2019 in confirmation with the latest guidelines of the Government of India. If any OBC-NCL candidate fails to collect the OBC- NCL certificate (issued after April 1, 2019) before online registration, he/she may upload a declaration (Declaration in Lieu of OBC-NCL Certificate) to that effect. Visit www.ncbc.nic.in for latest guidelines and updates on the Central List of State-wise OBCs. Physical Disability certificate (FORM-PwD II/III/IV whichever is applicable]) issued by the notified medical authority. Dyslexic candidate needs to submit FORM-DYSLEXIC 1 and 2 instead of FORM-PwD. The certificate must mention 'SEVERE' to enable the candidate get the benefit of PwD category. Individual IITs may constitute a medical board at the time of admission to test the candidate's level of disability. Other Backward Classes belonging to the Non-Creamy Layer (OBC-NCL) - 27% of seats in every course. OBCs should be listed in the current updated central list of OBCs (www.ncbc.nic.in). OBCs present in the state list but not covered in the central list of OBCs (as per the list in www.ncbc.nic.in) are not eligible to claim the reservation. The criteria for Non-Creamy Layer (OBC-NCL) will be as per the notification of Government of India. Candidates belonging to the creamy layer of OBC are NOT entitled for reservation. Such candidates are treated as belonging to the general (GEN), i.e. unreserved category, and they will be eligible only for the OPEN seats - the seats for which all candidates are eligible. Scheduled Caste (SC) - 15% of seats in every course. Scheduled Tribe (ST) - 7.5% of seats in every course. The benefit of reservation will be given only to those castes and tribes that are mentioned in the respective central list of corresponding states published by the Government of India (websites: http://www.socialjustice.nic.in/ and www.tribal.nic.in). Persons with Disability (PwD) - 5% seats in each of OPEN, OBC-NCL, SC and ST category seats. Benefit would be given to those who have at least 40% impairment irrespective of the type of disability i.e., loco motor, visual or SEVERE dyslexic. Leprosy-cured candidates who are otherwise fit to pursue the courses are also included in this sub-category. Candidates belonging to the OBC-NCL, SC, ST and PwD categories will be declared as qualified on the basis of a relaxed criterion. Unfilled seats reserved under OBC-NCL category will be de-reserved to OPEN category seats. However, seats remaining vacant under the SC and ST categories shall NOT be de-reserved to any category. The reservation for PwD candidates is horizontal and hence, unfilled seats will be de-reserved to the respective categories i.e., unfilled SC-PwD seats will be converted to the SC category seats and so on. The category of a candidate as entered in the database, which will be made available by the JEE Apex Board [which conducts JEE (Main) 2019 examination], will be final and requests for change of category will NOT be entertained. The admit card will bear the following details of the candidate: Name, Roll number for JEE (Advanced) 2019, photograph, signature, date of birth, address for correspondence and category. In case of any problem in downloading of the admit card, the candidate should immediately contact the Chairman, JEE (Advanced) 2019 of their respective zonal coordinating IIT. A copy of the downloaded admit card should be produced at the time of examination. The original admit card will be issued to the candidate during the Paper 1 of the JEE (Advanced) 2019 examination. This original admit card must be retained safely till all the formalities of admission are complete.